Home > Mutual Funds - SIP > SmartSIP : Mutual Fund Investors can make smart allocations between equity and debt every month..! SmartSIP : Mutual Fund Investors can make smart allocations between equity and debt every month..! 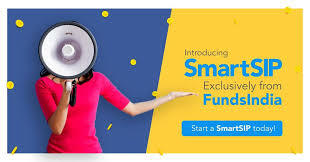 Chennai based FundsIndia, the country’s largest retail investment platform, announced today that it is launching FundsIndia SmartSIP, in association with Franklin Templeton AMC, for its customers. This first-of-its-kind servicecombines the discipline of SIP along with dynamically managing the monthly SIP allocation to each fund based on market conditions. SmartSIP invests in an equity fund and a debt fund, from the Franklin India stable, every month. By default, the equity fund’s allocation would be 70% and the debt fund would receive 30%.However, allocation to the equity fund and the debt fund will dynamically change every month based on both market fundamentals and momentum factors. “This provides twin benefits to the investors”, said C R Chandrasekar, CEO of FundsIndia. “Our customers are always worried about two things – one, whether they are investing in the right funds, and two, whether they are investing right in the current market. This solution addresses both questions in an objective, impartial manner. Theyalways ask ‘How do I build wealth without incurring more risk?’ We have tried to find the answer using mutual funds and a quant model to guide the allocation dynamically. That it does so in the context of the simple SIP structure is an added bonus”. This service is available immediately in the FundsIndia platform with a minimum SIP investment of Rs 5000 a month. One can learn more about it by writing to contact@fundsindia.com or by visiting www.fundsindia.com/smartsip. FundsIndia, an initiative of Wealth India Financial Services Pvt. Ltd., is India’s first online-only investment website. A free investment platform, it offers an array of financial products like mutual funds, equities, and deposits. FundsIndia has over 1.5 lakh investors on board, over Rs. 4500 crore in AUM, and processes 2,40,000 SIPs every month. FundsIndia also offers value-added services like free financial advisory services, flexible SIPs, trigger-based investing, access to India’s most comprehensive automated advisory service – Money Mitr, and more.